Most of the places on that list are in New Mexico and Arizona. Six of the sites are in New Mexico and three are in Arizona. 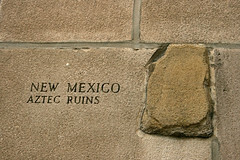 Of all the places on that list, I think the Aztec Ruins in NM look the most appealing. Park entrance is a mere $5, which is a pittance considering how enormous the site is. It’s a self-guided 700 yard walk through ruins build centuries ago. There’s also a semi-subterranean structure over 40′ in diameter. Pretty cool I think. Aniakchak is the least visited National Park for a reason, it’s remote and has horrible weather. As you would expect, none of the fourteen visitors in 2009 paid a fee and no one who visits in 2010 will have to pay a penny either. The Aniakchak National Monument and Preserve stretches over half a million acres of wilderness and there is plenty of rafting, hiking, and sport fishing. It’s main claim to fame? An “impressive six-mile wide, 2,500 ft. deep caldera formed during a massive eruption 3,500 years ago.” Sounds cool enough, I’ll let you know if I visit it!